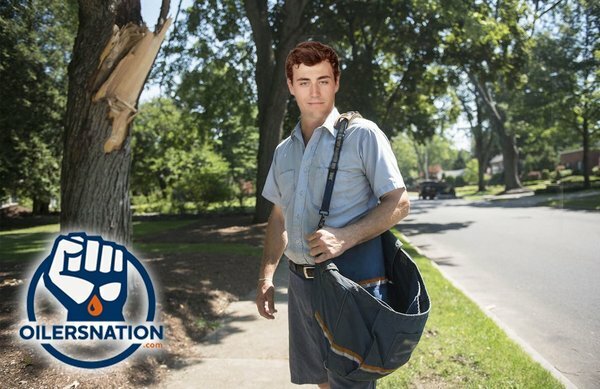 Home > Oilers Talk > Monday Mailbag > 2017 > 02/27 > Monday Mailbag – How do I Survive a Playoff Run? Whether you’re killing company time, or laying in bed in your Garth Brooks pyjamas, the mailbag is here to help you make a dent in your Monday. Whether you’re doing everything you can to avoid being productive until it’s time to leave or watching the clock until it’s socially acceptable to drink, I’m just happy that you’re here. If you have a question for the mailbag, you can email me or hit me up on Twitter. Until then, I present another edition of the Mailbag. 1) Bryan asks – Like Burns and Byfuglien before him, does Darnell Nurse possess the skill set to transfer to the wing? And could this be a good choice for easing him back from injury rather than take out a guy who is playing well and just finding his stride like Davidson? Nurse is a defenceman. Play him on defence. How is asking him to play a position he’s never played easing him back in. Even if Oilers D was completely healthy I wouldn’t do it. He plays defence. I imagine it will actually be Gryba/Benning who come out of the lineup (assuming everyone is healthy) rather than Davidson, and of course there’s no guarantee that Davidson is still with the Oilers past Wednesday’s trade deadline. The larger problem with moving Nurse to the wing is that wingers just don’t have the value that defencemen do. Winnipeg has experimented with Byfuglien on the wing, but the results have been significantly better with him on defence. San Jose experimented with Burns on the wing, but then went to the Cup final last year with him back where he belonged on the blue line. Rather than experiment with Nurse at a new position, it’s probably best to leave him where he has the most value. I think Nurse is shy offensively compared to Burns and Byfuglien, and we hope he has less chaos than either man defensively. For me, Nurse is not a comparable player. You think Davidson has been playing well? Nurse needs to establish himself as an NHL player — he will — before anybody starts worrying about changing his position. I wouldn’t say that it’s a good idea to do this to ease him back from injury. I would rather see him stay on the blue line his whole career. His size and puck movement is much more needed on defence. I respectfully disagree, sir. Darryl needs to play where he’s most comfortable and, for now, that’s on third pair with a competent partner. 2) Sarah K. asks – Is it at all a concern that the Oilers can look like different teams from game to game? What do they need to do to improve their consistency? Not much of a concern for me. No team plays great all 82 games. The best part about the Oilers this season is they rarely play poorly in consecutive games. One easy fix would be separating Connor McDavid and Leon Draisaitl. Right now the Oilers live and die with a single line, and naturally it’s led to some inconsistency. Having two effective lines (say Maroon/McDavid/Eberle and Lucic/RNH/Draisaitl) should help stabilize night-to-night performance. I think this is what progress looks like. Edmonton is far from being a complete team, but if you run a game from this year against the team from a few years ago, things are tightening up. So my answer to your question is no, I am actually encouraged. Inconsistency is a challenge for all teams, especially one dotted with young, developing players like the Oilers. Experience is the best medicine for inconsistency. Yes, they do need to work on consistency, but they are night and day from previous years in that area. I think it’ll come as they build more success over the years and they get more taste of winning. I agree that sometimes they look different but this is still a drastic improvement over what we’ve watched for the past 10 years. Remember the very first game that Taylor Hall played with the Oilers and Jordan Eberle scored that amazing first goal? How did that season end up working out? 3) Braden asks – The Oilers have three UFAs not counting Ference that are scheduled to come off the books (Hendricks, Russell, Gryba) and I’d like to ask the panel if they think any of these guys will be moved at the deadline? Don’t see why you’d move any of them. I’m amazed how many people are so stubborn in their dislike for Russell they actually consider trading him at the deadline. It is idiotic, but with recent injuries to Larsson and Sekera, just illustrates even more the need for depth on the blueline. That’s tough. I’d be surprised if Kris Russell were dealt. The case for Matt Hendricks is that he’s replaceable internally, but NHL teams typically put a lot of value in having veterans in the postseason so it isn’t a slam dunk. Eric Gryba certainly should be moved if he has value – he isn’t better than Mark Fayne – but it’s also hard to blame teams for wanting a ton of defensive depth. I’d guess it’s probably right around 50/50 that one of Hendricks/Gryba gets traded. I don’t think so, although the Oilers may have replacement players for Matt Hendricks. Todd McLellan, like most coaches, likes his veterans. He has the team on a collision course with the playoffs, suspect all veterans remain after the deadline. Don’t see it, outside of Hendricks who might be seen as veteran depth for a team loading up. Gryba is cheap and worth keeping for depth and Russell, unless he’s looking for stupid term and stupid money, should be re-signed. As much as I am opposed to this, I think Hendricks would be the guy to go out of that group of three. I think it all depends on whether Chia is looking for winger depth or defencee depth. I can see Hendricks being shipped out only because I think the Oilers have similar players in their system. I think the other two will be around though. 4) Oil or Death asks – Peter Chiarelli said that he won’t likely be big game hunting at the deadline but will look to tweak the roster. Do you think that gives a positive message to the team that he believes in them or a negative message that he doesn’t think they’re good enough for a run? Players know what type of team they have. They believe in themselves and whether they add a centre or RW or not, they will still go into the playoff feeling confident. I remember when the debate in 2012-13 was whether the Oilers could afford to move Ryan Whitney because it might send the wrong message to the team. It was a silly debate: the right thing to do was to do what was best in the long-term interests of the team, and not worry so much about hurt feelings. As for what the right thing to do is, that’s a little less clear. Given the state of the West, I’d be sorely tempted to take a chance on this team and bring in a sizable piece. I think NHL general managers do their best to avoid giving out their actual plans for the deadline. I do think PC is going to add at the deadline. Neither. It’s a realistic take on where the team is now. Definitely a positive. No one is expecting them to win the cup this year so they shouldn’t be offended if that’s Chia’s reasoning. A good team doesn’t necessarily have to make a huge splash to make a run so we’ll see what happens. I think it’s funny that Chiarelli doesn’t show his cards. Having a GM keep things private is nothing new but the funny part comes from how alarmingly different Chiarelli’s approach has been as compared to MacT. 5) Pete asks – I was 15 years old the last time the Oilers made the playoffs and I’d like to ask the writers for a world of advice on how to survive my first playoff push? Drink lots of water when you go out and have fun. Don’t be an idiot and want to break stuff. Be loud, be friendly to fellow Oilers fans, but be respectful to others and to a business’s property. Just enjoy it. Playoff hockey is the best hockey, whether you’re a fan or media. Ride the rollercoaster; that’s what makes it fun. I would say enjoy it to the fullest. Being a fan of the town team involves the lowest lows and the highest highs, and it has been a long time since the postseason was an option. Be safe, don’t do anything illegal, but beyond that enjoy the living hell out of it! You’re 25 or 26 and you need advice on how to survive the playoff push? Take it all in. Enjoy it. I too was only 14 when they made the playoffs so I too am looking for an answer to this. Stay hydrated, my friend. As someone that went down to Whyte Ave after almost every single playoff game in 2006, I can tell you that your liver is going to take a punishment if this thing can last a few rounds. That said, don’t be a dickhead. We’re all in this thing together. At ATB, we hear you: being a hockey fan is expensive. We want to make it cheaper for you. Tell us how you and your squad celebrate hockey and you could win $1,000! Learn more at ATB.com/yegfans. Monday Mailbag – Who is feeling more pressure: Chiarelli or McLellan? Monday Mailbag – Should the Oilers trade Darnell Nurse for scoring help? Talbot is the absolute, single, solitary reason we are actually IN a playoff spot. We are playing meaningful games in March. We are looking to add at the deadline. We don’t give a crap who the 1st overall draft will be this summer. Considering the number of games his supporting cast have taken off so far this season, he is allowed a few bad goals. Next game will be a 60 save shutout!! Can’t dispute Talbot’s contribution. Our defense is weak in our own zone(Sekara, Benning,Klefbolm,Russel). Yes they move the puck IF IF IF they can get the puck. Here lies the issue. This puck moving part is only 50% of the equation. Puck transitioning and puck separation are as critical. We will be lucky to go 50/50 til the end of the year if we give up 3 or more goals in our remaining games. Fayne better than Gryba. In what world? Fayne would be up and Gryba not signed. Remember Gryba would likely not clear waivers at this point of the year. Willis must stop making judgement based on shot proxies. Makes him look like a buffoon. FYI – Manning suspended for 2 games for a dirty hit over the weekend. I wonder if all the SN crew is going to keep saying “how wonderful of a kid this is” and “how he took it like a man”. This kid is headed down the road of a Torres reputation in a hurry. What world do you live in Willis? You must think Chiarelli is a moron then playing Gryba ahead of Fayne. I sure would like to know your reasoning for saying that. Baggedmilk, you should run a contest. “Who has gone through the most changes since the Oilers last made the playoffs?”. I bet there would be some interesting entries. A Golden rule for the modern age. What happened to Matt Henderson? Gregor said you have to be an idiot to trade Russell at the deadline. So Oilersnation decided not to have an idiot on the panel this week. Is Gregor the overseer of this site/the whole Nation? I have noticed since he got lambasted for his Russel artical he has slowed down his posts a lot. I think he is a good writer, I appreciate his effort, and by all accounts is a good fellow. That said, his hockey insight seems to no stronger than the average fan, and I currently skim over his answers quickly. This isn’t a slight on him, but respect for Brownlee, Gregor, and others…..I really miss Studs and would love to see another ex-Oiler answer these. Apparently infamous Uber driver Mike Commodore tweeted out rumours of an Eberle for Hamonic deal in the works. He is also suggesting James Neal for Evander Kane. *He is now saying LAK is in on Kane. Figures. They like their reclamation projects out there. Trade deadline season is more exciting then draft lottery season!!!! I look at calgary and can’t help but think they might pull a blockbuster at the deadline. Wouldn’t surprise me if they went in hard on a big player. I hope Chia doesn’t get itchy trigger finger but I also hope he adds a Vanek or a Boyle. That would be exciting. Hanzal was expensive and wow…that bishop trade was outside the box to say the least. Bagged milk when can we expect a trade brother? I hope Chia Pete knocks our socks off. Give the people what they want, what they NEED! With the Nurse to forward question, I think its a very easy idea to shoot down and for sound reason. However, TM said himself in an interview before or after they played the sharks that he thought Burns spending time up front may have contributed to his offensive skills back on the point. Burns didn’t even come close to a point per game at any level of hockey previous to his stint as a forward with the SJS. So where did it come from? How did he find his elite level offensive game after 9 seasons in the NHL? We have also witnessed at the AHL level what Joey Leleggia has been able to do as a forward. Lowetide suggested calling up the entire line of Leleggia – Lander – Puljujarvi in part because of his success. So unconventional and uncomfortable for many to consider, but I don’t mind the idea. I think it would be more of a concern about how much the team would miss him on D rather than Nurse not being successful up front. If they had of done this with JSchultz we may have got more than a 3rd on trade. Appreciate the advice on how to survive the playoffs and as a person who worked the door of a bar on Whyte Ave during the 2006 playoff run…listen to their advice. Take it all in, have fun, drink lots but don’t be an idiot! Met many friendly, fun fans during that run but also two hand fulls that let the liquid courage get the better of them. Can’t wait for the playoffs to start but am also getting nervous that the our once comfortable lead is shrinking.